The upcoming Captain America: Civil War is both the sequel to the hit Captain America: The Winter Soldier and the launchpad for Phase 3 of the Marvel Cinematic Universe on the big screen. As such, the film's directors Anthony and Joe Russo and writers Christopher Markus and Stephen McFeely (the same team responsible for Winter Soldier) are aiming to balance the movie's central story thread - the battle of ideologies (and fists) between Chris Evans' Steve Rogers and Robert Downey Jr.'s Tony Stark over a new superhero registration act - with its universe-building duties; that includes, introducing both Black Panther/T'Challa (Chadwick Boseman) and the new Peter Parker/Spider-Man (Tom Holland) to the MCU. Holland's appearance as Spider-Man in Civil War should allow the character's 2017 solo film to avoid having to re-tread certain over-done elements of the web-slinger's origin story, though the specifics of Peter Parker's role in the Russos' movie remain under-wraps for the time being (as does the character's costume design in the film). However, the latest Civil War artwork to make its way online does highlight T'Challa in action, while also shining a light on the most recent superhero to join the MCU: Scott Lang aka Ant-Man (Paul Rudd). 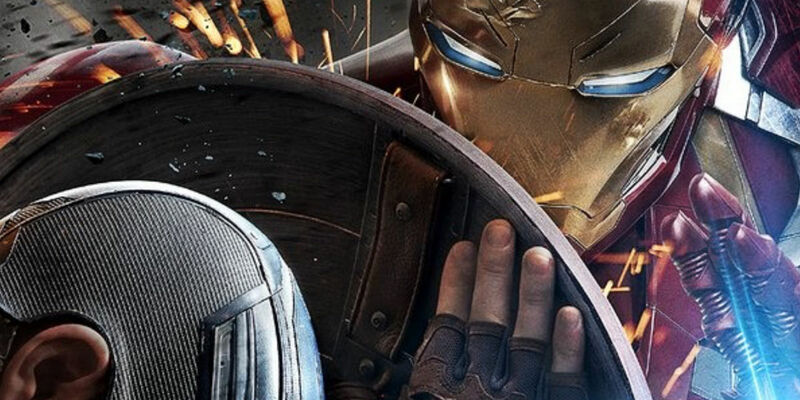 Said Captain America: Civil War artwork made its way online via Hablemos de Marvel (h/t CS). Most of these images simply offer a look at individual superheroes (as well as Iron Man and Captain America's respective "teams") in a manner that resembles that of previously-unveiled Civil War artwork. However, the pics featuring Ant-Man and Black Panther in particular are worth discussing further. It remains to be seen if Captain America: Civil War actually includes a shot of Ant-Man hitching a ride on one of Hawkeye's (Jeremy Renner) arrows like he does in this artwork, but it would certainly make for a great on-screen moment - should either that or a similar beat happen. Now that Marvel Studios' visual effects artists have a firmer grasp on how to handle the complicated task of realizing Ant-Man's comic book abilities in live-action form, it stands to reason that Civil War will include a sophisticated shrinking action sequence (featuring Scott Lang) along these lines. The character is also an outsider of sorts to the Avengers' in-fighting (though he is confirmed to be on Cap's side), and could thus bring a different (and necessary) perspective to the proceedings. Black Panther also brings an outsider perspective to Civil War - and though he's shown battling Cap in the above artwork (during what appears to be the car tunnel sequence glimpsed in the official Civil War trailer), his allegiances will remain fluid and change as the character deems fit. Furthermore, if handled well, Black Panther's story thread should laid a solid foundation upon which the character's solo movie (which will open in 2018) can build directly and better heighten the sense of inter-connectivity between Marvel's Phase 3 films. Captain America: Civil War hits theaters on May 6, 2016, followed by Doctor Strange – November 4, 2016; Guardians of the Galaxy 2 – May 5, 2017; Spider-Man – July 28, 2017; Thor: Ragnarok – November 3, 2017; Black Panther – February 16, 2018; The Avengers: Infinity War Part 1 – May 4, 2018; Ant-Man and the Wasp – July 6, 2018; Captain Marvel – March 8, 2019; The Avengers: Infinity War Part 2 – May 3, 2019; Inhumans – July 12, 2019; and as-yet untitled Marvel movies on May 1, July 10 and November 6, 2020.